From left to right. Being right side of my black tool box to the wall is 7 feet. 2 feet minimum away from the wall for depth. 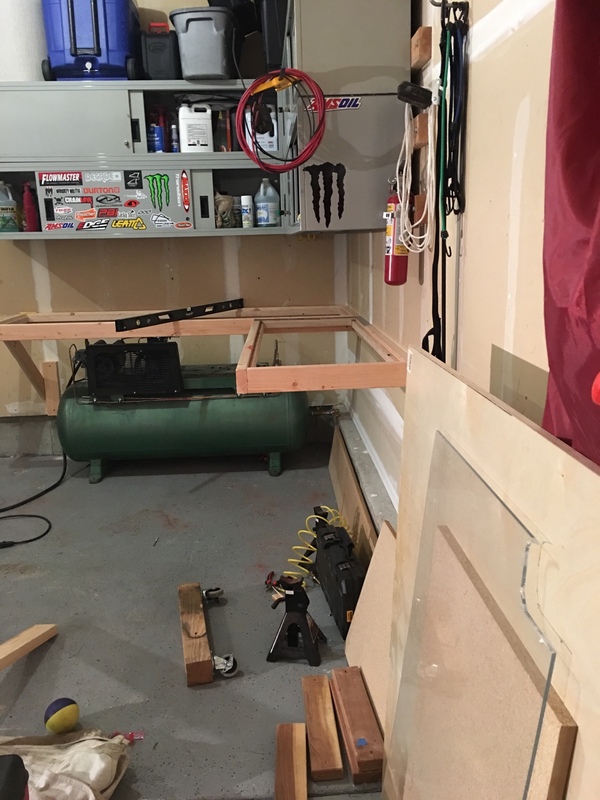 My plan is to box in my compressor with a work bench. I have since removed the wheels and blocks ( hockey pucks will be here tomorrow ) to save me some height restrictions. 2. What wood from the local Home Depot should I use for my top. 3. Should I do vertical supports to the ground or should I do angled to the wall then I have floor space ? 4.What have you all used in the past to mount a vice to the bench? I have a vice it's kinda small 3 inch jaws. I want a bigger one. Harbor freight cheapos ok? 5. One of my favorite finds was and is my bench grinder it's amazing! What should I do to mount it to my bench? 6.What good ideas can we come up with for the debris that comes out of the back of the grinder? My previous set up made a terrible mess of my painted garage walls and my bench. 7. I want to use peg board on the back wall and maybe screw a sheet of wood to the bottom of the metal cabinet so I can attach a work light of some kind. Changes or other thought I should consider? Keeping the early morning rolling, the afternoon hours snoring, the late night hours feeling the powers. Re: Building a work bench. Ok the from floor to top of the a/c is 37 inches. The widest part of the a/c is 2ft. The wall and the tool box is seven feet. The metal shelves are 57 inches from the floor. Now that I look at this I think the bench will have a L shape to is down the side of the garage. Remember you are going to need airflow around that compressor. What would you define air flow as. ? I had given thought to mounting a fan on the back portion ( cpu size ) for extra air but have since though that would be overkill. Might replace the cord with a heavier longer one. The final hope is to add some power behind it. I think you should wire a plug-in to the home system so you aren't moving the dryer and adding extension cords each time you need to use it. It will be ready to go whenever you need air. dave, can you give us a pic from a farther distance......so we can see all around the area that you are wanting to build this in.....? Is the dryer on the other side of the wall? It would be nice to have 220 in the garage. You could use it for more than just the compressor. 220 will be handy for many things. I see you have some Craftsman Nextec tools too. I have a couple sets of those. Love those overhead cabinets too. Locks make it nice and were probably a bargain. I think I'd drop a 50 amp 220V plug right behind the compressor, then make up a 220V extension cable out of some heavy three stran wire. That way you could unplug the compressor and plug in a mig and have a range of travel. I put two 50amp 220VAC plugs in my garage. One for the compressor, and the 50' extension cord on the other for either the welder or the plasma. HD or lowes has 3 or 4 wire cable to make up a longer cord or extention. I made a 20 ft 4 wire extention cord for my welder. Piece of cake. Look at some tops on Global Industrial or Uline. You can get the butcher block style tops about 6 ft to use for the top. Ok I lied. I couldn't put away the mess. Needed to finish it. I am sure the neighbors hate me a little after screw guns and skill saw at 11:40pm. Anyway here is all but finished product. Then I am going to use the same 1 x to frame in some peg board and use it to hang random tools and what not. Also going to look for that new vise and bring and mount my bench grinder. So far so good. As for the 220 just get an RV cord. When I was looking for my plasma the best I found was an 50 amp RV cord. Plus the end has an LED to show you have power. Buy the time you get cable at $1 a foot, 2 plugs it is cheaper. I'll have too look where did you find yours at jr ? Oh and the bench looks good Dave, I assume you put a wall brace at the inside corner by the compressor too? I like the removable top idea. Depending on how much you twist on what ever is in the vice, make sure that top is secured well. If you are going to do any kind of welding or grinding Id cover the top with sheet metal. Did that in our shop. 3/16 thick if I remember right.Comes up the front a couple inches to protect the front and up a couple inches in the back for a back splash. All one piece we had it bent at the local welding/fab shop. Wood and cardboard make pretty good temporary welding tables! Got mine on Ebay, 25ft 50amp for $62 shipped. 25ft will go anywhere in the garage, out to the street plus a little as the plug is in the front of the garage. Both my mig and my plasma will also work on 110, but 220 is the way to go. Dave, I'd keep your eyes peeled on Craigslist for a good OLD vise (you can set up email alerts when a certain keyword shows up "vise"). I bought a HF and its junk. The jaws don't open and close smoothly, probably due to the crummy Chinese casting. Maybe I just need to oil it up real good, but there are times that I can't spin the handle freely with one finger because it binds up. Great pickup. Good work on the bench. I inherited my grandfathers Milton vise. I haven't measured it but that thing weighs 50 lbs if an ounce. I need to give it a good cleaning. Just took it off the bench at home and moved the bench to fit the wifes new (to her) SUV in the garage. If you try to tighten a harbor freight Chinese bench vise with too much force, the threads in the casting will strip out. Not sure if that is common for all of them, but mine stripped out pretty easy. I was tightening by hand, not using a cheater bar or anything like that. Might have been a bad casting, but it looked fine at first. Good news is HF traded it easily for another one. I have been very gentle with the second one and it's a couple years old and still working. I guess my problem is very gentle and bench vise don't fit together at my place. Mine is one of those old heavy hand me downs. I have ripped the bench mounting holes a couple times but the vise is still there waiting to be abused. Yeah Dave. That was a poor attempt at humor. Looking good! Dave, be careful with that 20 amp breaker. If the wire is only 14 gauge (typical for 15amp) then you are technically going against electrical code. Can 14ga wire handle a 20amp load, probably, but just be careful. How do I figure out what gauge wire is coming from the wall. Can I measure it? 14ga is usually in a white outer jacket, 12ga in yellow. You can use your wire strippers to measure the actual size of the copper. the wire will almost always have the type THHN, etc, and the gauge and temperature rating. I would look at it very carefully. The length of the run is also important. Longer runs have more resistance and reduce the ampacity. 14 is only good for 15 amps. Don't play games with electricity. Not worth burning a house down over.